Before the “I do’s” are said, there are clues to this neurosis just begging to be recognized. It is best to face them now, afterward it may be too late…. She has a collection of Disney movies that would ignite jealousy in an 8-year-old. You hear him humming “The Clean Up Song” from Enchanted while washing the dishes. Everywhere you go, he finds at least one hidden Mickey. She named her dog Pluto, her cat Dinah and her fish Cleo. His car is named Yensid and there’s a bumper sticker claiming that his other car is a monorail. Anytime the two of you are about to get off a bus, she says, “por favor, manténgase alejado de las puertas”–which is perplexing to you because you know she doesn’t speak Spanish. When she went to Paris, she was disappointed that it wasn’t smaller….like the pavilion in Epcot. She tells you that your 3 freckles make the cutest hidden Mickey. His MacBook has a sticker of Snow White eating the poison apple. He knows that Donald Duck’s middle name is Fauntleroy. She feels that a visit to Epcot far surpasses the educational value of a week in a college classroom. He always takes off from work on November 18. The words “wedding,” “honeymoon,” and “Disney World” have been uttered in the same sentence. If you have found yourself in this situation, there is no fighting it. Your significant other will not change as there is no cure. Your choices are: accepting, embracing or setting free. 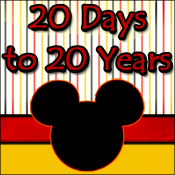 Choosing to embrace this Disney Lifestyle will give you both years of joy!